The result of this battle was really something like a nightmare for the Alliance. Baek Mu Ryang, the leader of the Alliance, and the member of the three sovereigns, lost to Gongson Chun Gi. And in addition, the Sword King stepped down from his position as the leader. Thanks to that, the Alliance lost quite a lot from this war. Many experts died, and the central figure stepped down. Morale was also at its lowest. And unlike the Alliance, the Heavenly Demon Church earned much from the battle. The Lion Sword King, Yu Sul Bin, looked at his senior brother, the past leader of the Alliance, with a dark face. Baek Mu Ryang. He looked upon his junior with a exhausted face, and sighed. Yu Sul Bin began to cry as he talked. To him, his uncles were like his precious grandfathers. People that were that dear to him died in front of his eyes. They died in the hands of the Blood Sound Demon, Ju Sang San……. Yu Sul Bin couldn’t do anything despite of being only an arm’s length away from his dying uncles. This event truly made him realize how weak he really was. He lacked experience. He had realized that the hard way. Baek Mu Ryang pat his junior’s back, and spoke a few words. Yu Sul Bin sat on his knees in front of Baek Mu Ryang. He bowed down, and spoke. Baek Mu Ryang let out a regretful sigh as he looked at his junior brother. Yu Sul Bin was a relaxed, easygoing person. But at the same time, the man was extremely efficient and responsible in his missions. Likewise, the man usually felt that he himself would be responsible for everything. Baek Mu Ryang massaged his shoulders, and smiled inside. Baek Mu Ryang was feeling very unstable right now. He experienced the might of the Pope, and when he was utterly destroyed by the man, he felt desperate. This kind of feeling was not something he had ever felt before in his life. It didn’t even look like the Pope gave it his all. A light punch. Baek Mu Ryang wasn’t even able to take that. It was saddening. His sky-high pride was shattered in an instant, and it even made him feel like it was a shame to not have died there on the battlefield. Following the defeat of Baek Mu Ryang, the Alliance had to suffer from the Pope’s wrath. A massacre. Because of a single man, the pope, the whole situation flipped 180 degrees. If the monk from the Shaolin temple, the Godly Monk Kongye, didn’t intervene, the casualties would’ve been even higher. The price for blocking the Pope’s attack was too high. Kongye was one of the strongest martial artists even among the fifteen guests, and yet……. Even he wasn’t able to block the oncoming attack, and lost an arm. Truly, the Pope’s power was frightening. The realm above the Harmonious stage. The towering wall that even the strongest experts didn’t dare to climb. The realm that one would reach after climbing that wall would be the Godly Realm. Perhaps the Pope already reached that state, Baek Mu Ryang thought. Baek Mu Ryang was snapped awake from the words of Yu Sul Bin. He immediately sighed in his mind once more. Taking responsibility for all this trouble and stepping down was something that Baek Mu Ryang should’ve naturally done. Something that immense happened mere days ago. Did Baek Mu Ryang have to give out the punishment and stir up the Alliance once again, especially when it was beginning to calm down? It seemed unnecessary. That was why Baek Mu Ryang felt bothered when Yu Sul Bin simply came and started to ask for a punishment. Right now, Baek Mu Ryang needed peace and quiet, but everyone around him simply wouldn’t let him go. Baek Mu Ryang looked up at the sky with a tired face. He didn’t want to do anything right now. He just wanted to rest. The Heavenly Demon Church, Gansu Branch. In the Resting Pagoda, there was a casket. In the casket lay Jo Gi Chun, and in front of it stood Gongson Chun Gi and Cho Ryu Hyang. A stuffy voice. Gongson Chun Gi thought for a long time, and looked at his disciple. Cho Ryu Hyang couldn’t say anything. He simply looked at his dead teacher with pale, lifeless eyes. His eyes were all puffy from crying, and his face held no life. Gongson Chun Gi, looking at that, pulled out a small gourd from his sleeve and opened his mouth. A dry, raspy voice flowed out of Cho Ryu Hyang’s mouth. His tired self somehow managed to open his mouth. Gongson Chun Gi sat down on the edge of the casket, and opened his mouth. Cho Ryu Hyang thought for a bit, then nodded. Cho Ryu Hyang never saw his teacher drink. It didn’t really look like his teacher liked to drink, either. Gongson Chun Gi drank a few sips directly from the gourd, then suddenly asked Cho Ryu Hyang a question. Cho Ryu Hyang couldn’t respond. That was because he didn’t know about it. Indeed. When he thought about it, he didn’t know a single thing about Jo Gi Chun. In the past, they always talked about math and formations, pretending that they knew everything about each other already. Pretending that they understood each other perfectly. That’s how they functioned. But when Cho Ryu Hyang actually tried to think about his teacher, he came up with nothing. Did his teacher like drinking? Who was his teacher’s family? He didn’t know the most basic thing about teacher. He felt desperate. When Gongson Chun Gi realized that his disciple’s face was getting darker, he opened his mouth. 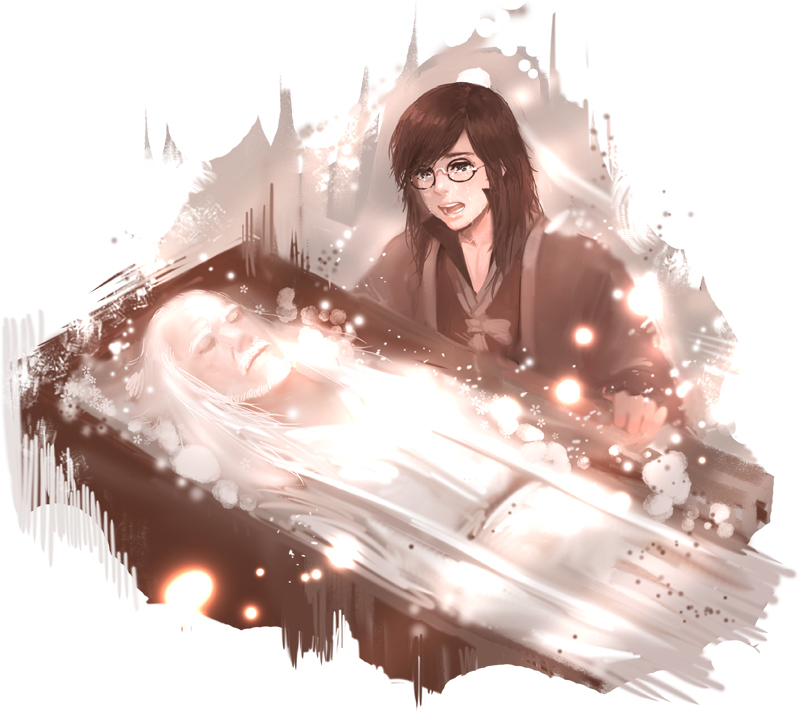 Cho Ryu Hyang didn’t feel that he had the right to hold onto the corpse. He was even shameful that he was here in the first place, when he knew next to nothing about his teacher. He felt ashamed. Gongson Chun Gi, looking at that, opened his mouth. Cho Ryu Hyang’s chest felt stuffy again. That was because he just remembered something his teacher said before death. His teacher was worried about him, even when dying. Cho Ryu Hyang, when he thought about that, couldn’t even lift his head. Cho Ryu Hyang began to think when Gongson Chun Gi said this. Right. It wasn’t like he really knew nothing about his teacher. He knew what his teacher liked, and what his teacher’s personality was like. And his teacher was the only one that could talk using mathematics. The information about his teacher that others didn’t know about. He knew about those. Gongson Chun Gi put his hand on the sniffling boy’s head, and smiled. Cho Ryu Hyang fiddled with his glasses, and made a complicated face. He didn’t know how he should respond. Yes. He was young and powerless. He couldn’t do anything when Jo Gi Chun died. It was a really arrogant statement. But it somehow displayed how much Gongson Chun Gi cared for his disciple. Cho Ryu Hyang, who realized that, tried to smile for Gongson Chun Gi’s sake. When Gongson Chun Gi saw that, however, he simply grinned and said something. When Cho Ryu Hyang’s face relaxed a bit thanks to his teacher’s joke, Gongson Chun Gi spoke. Cho Ryu Hyang nodded. And his eyes began to reflect eyes of rage, unlike before. He couldn’t be satisfied with surviving. He managed to live by getting drenched in his teacher’s blood. There was no way he would end it at that. Revenge. The Alliance. He had to receive the payment from Yu Sul Bin for killing his teacher. That was the only thing Cho Ryu Hyang could do while he was alive. If there at least wasn’t a motive like this, he would’ve gone crazy a long time ago. Gongson Chun Gi, after observing the bloodthirst contained within the boy’s eyes, scratched the back of his head and spoke. The people Gongson Chun Gi killed in the battle was said to be a thousand. That was why Cho Ryu Hyang really couldn’t say anything when Gongson Chun Gi said that with such a straight face after killing so many people. Gongson Chun Gi paused a bit, then looked at Cho Ryu Hyang and opened his mouth. Cho Ryu Hyang couldn’t say yes straightaway. That was because the only thing he wanted to do at the moment was to take revenge for his teacher. Cho Ryu Hyang just looked at Gongson Chun Gi without a word. Gongson Chun Gi stared back with a complicated expression. Gongson Chun Gi wasn’t comfortable seeing that the only thing that drove his disciple to learn martial arts was revenge, but he completely understood what Cho Ryu Hyang was feeling right now. Gongson Chun Gi, believing that time would wash away the feelings of revenge, opened his mouth. There was nothing one could get for free in this world. Becoming the heir to the church was sheer luck, but it wasn’t like he could just learn the martial arts of the church for free because of that. Martial arts demands one thing in return of learning it. Dedication. When Cho Ryu Hyang responded with a resolute voice, Gongson Chun Gi leaned back a little in his sitting position, and spoke. The purpose of him learning martial arts was definite. When Cho Ryu Hyang set his mind in stone like this, Gongson Chun Gi fell into a deep predicament. The experts at the Alliance weren’t weak. The only martial arts that could surpass them was the Shura Environment. Normally, he would just pass on the martial art without even thinking about it. But right now, Gongson Chun Gi was greatly concerned about it. There was no doubt that Shura Environment was strong. It was probably the strongest in the world. But doesn’t this martial art have a terrifying side effect not many know about? The effect of turning insane when seeing blood. Berserking Blood Effect (狂血症). Even Gongson Chun Gi, who overcame many, many walls after years of training, still was unable to surpass this side effect. After using a certain amount of strength, the blood in the body goes crazy. Then, the sanity in the user’s mind slowly disappears, and in the end, it turns the user into a blood-craving monster. Should he really teach such a thing to his disciple? A one that craves revenge, at that? Gongson Chun Gi thought and thought again. Teaching the Shura Environment would be detrimental for the boy’s development. After thinking for a long time, Gongson Chun Gi put on a bright face, and looked at Cho Ryu Hyang. Cho Ryu Hyang pulled out the book from his clothes, then flinched. There was a bloodstain on the cover of the book. Wasn’t this Jo Gi Chun’s blood? His heart, which somehow calmed just moments ago, started to pound vigorously again. When Cho Ryu Hyang’s eyes began to turn red from rage, Gongson Chun Gi spoke. Is this really something that was as good as the Shura Environment? Gongson Chun Gi put his hopes into the book, and opened its covers. He then began to slowly read it. The strongest martial artist in the world. He was judging the power of the book. And that actually took more time than expected. Thank you~ and welcome back! Thank you! Also I like how the author makes these interactions detailed. The characters move the plot instead of the fighting being the plot or revenge . It is refreshing after reading alot of chinese LN. Very few have a well balanced main character(or plot). I hope that your vacation was very refreshing!!!! Thanks so much for all your hard work and for bringing us all this great novel!!!! “But……. I know for a fact that there lives an unbeatable monster known as ‘obligations and resentment (恩怨)’ in the martial world.” Never truer words. “Snow will only appear during winter,” he said quietly, “and can only exist in the cold wind. Therefore, its life exists only during the depths of winter.” He pulled his hand back into the carriage and held it next to the copper oven. The snow began to melt, turning into water, which flowed through the creases of his palm. You won’t get any deeper than this. I Shall Seal the Heavens ftw! I also like Shura though. From Simply scholar to a king, this is the moment all will remember.